Photographs of the male Madagascar wrasse, Macropharyngodon vivienae. This species was first described from Madagascar but is now also known from Aliwal Shoal to Ponta Malongane in southern Mozambique. The Aliwal record is a range extension from Durban and is based on a female that was caught during a Fish-Watch collecting dive. M. vivienae, female, 53 mm. During a Fish-Watch dive on the Pinnacles at Aliwal in August, 1999, Phil and Elaine Heemstra saw a wrasse swimming close to the reef and agreed that it must be a male Madagascar wrasse. The male vivienae colour pattern has been described, but as far as we know there are no published photographs of it. The female vivienae is shown above. Note the black ocellus (eye-like spot) with its bluish border just above and behind the gill opening. The basic body colour of the adult male is the same, but the blue border of the ocellus breaks up, increases in area, and looks as though it has curdled into the black area. Males are also supposed to have two large oval dark red spots at the base of the caudal fin, but we didn’t remember that at the time, and never noticed them. 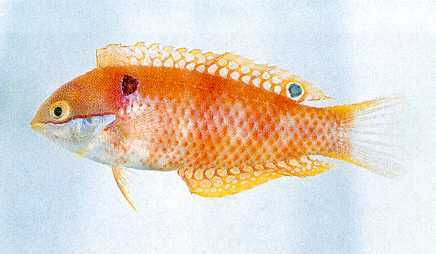 If you are a photographer, and are diving on the Pinnacles (or anywhere in South Africa), please look out for the male Madagascar wrasse. We desperately need a photo for Elaine’s painting to illustrate the sexual dimorphism of this species for our forthcoming book on Western Indian Ocean fishes. (You’ve read the text, seen the Worksheet, now wear the T-shirt.) These beautiful T-shirts show all 24 southern African butterflyfishes on the front. Dennis Polack had a great idea for a T-shirt, and it has come out very nicely. We only have large, XL, and XXL sizes left. Price: a bargain at R60 (including postage). We are pleased to report that we now have over 140 members in the East Coast Fish-Watch Project! But we need more members, and the larger our membership is, the more benefits will redound to each member. So please tell your friends about the Project and encourage them to join. With this third Newsletter and your third Worksheet, your “annual” subscription (R50 membership fee) for the East Coast Fish-Watch Project is now due. We hope you enjoy the newsletters and worksheets, learn something about fishes, and sign up for another “year” (a “year” in terms of the East Coast Fish-Watch Project is as many dives as we can fit in, plus the production of 3 new worksheets and 3 newsletters). and any ideas for improvements.